Capacity.. 2 000 000 litres. 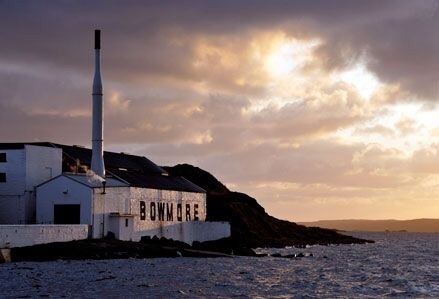 Founded over two centuries ago in 1779, Bowmore is the first recorded distillery on Islay (pronounced ‘eye-la’) and one of the oldest in the whole of Scotland. Islay malts are renowned for their peaty smokiness and Bowmore is no exception. We carefully smoke our malt in a peat-fired kiln, just as our ancestors did over 200 years ago. Bowmore Distillery has stood on the shores of Loch Indaal, a sea loch that opens out into the Atlantic Ocean, since 1779. The distillery’s proximity to the sea plays a vital role in shaping the final character of our spirit, which breathes in the salty sea air all the while it’s maturing. It’s Bowmore’s unique combination of the purest water from the Laggan River, floor-malted barley that has been carefully smoked in our peat-fired kiln, the finest oak casks left to mature in our No. 1 Vaults, Islay’s natural environment and a dedicated team of craftsmen that together create the perfect balance for which Bowmore is known and loved. Our whisky is made the same way today as it has always been, by a dedicated team of craftsmen, using time-honoured techniques passed down from one generation to the next. A job for life, our Distillery Manager has worked at Bowmore for over 40 years, as a man and boy. Bowmore’s now legendary No. 1 Vaults is a very special place indeed. The oldest maturation warehouse in Scotland and the only one below sea level, its dark, damp and cold conditions are perfect for maturing whisky. It’s here that our single malts spend their long lives maturing in specially selected oak casks, gradually developing the finest of flavours.